OREGON CITY — The Gresham boys basketball team battled back from 10 points down to put a scare into No. 8-ranked Oregon City before falling 44-39 in the first round of the 6A boys basketball playoffs Tuesday night. The Gophers opened the fourth quarter with Eric Puclik losing his defender to gain a wide path to the hoop for a layup. Moments later, Isaiah Butler reached in and poked the ball loose from Oregon City guard Corban Remsburg as he started into the lane. But the Gophers failed to convert the turnover into points at the other end, missing a chance to make it a one-possession game. Remsburg gave up the ball again on his next drive, although this time he did it on purpose, sliding a pass across the lane to Andy Talley for an easy two. Oregon City found itself up 37-30 with 4:21 to play. That's when Gresham made its final charge. Sam Igbonagwam knocked down a pair of free throws after being bumped on a baseline drive. Moments later, he put on some tight defense at the center circle, which prompted Oregon City to fire an errant pass out of bounds. Gresham's Daello Portin-Chapman hit a jump stop in the lane and spun away from his defender to hit an 8-footer. He struck again on the team's next trip down the floor, driving into the paint and swishing a shot while fading to his right. The Gophers were within a point with 3:05 to play. "We created a little bit of pressure and got some tempo going," Gresham coach Erik Lyslo said. "We saw the ball go through the basket a couple times and that go us going." Gresham gave itself a chance at the lead when Ethan Abrahamson went straight up to block a put-back attempt by Oregon City's Erich Nova. Action flowed the other way, but a jumper from the elbow came up short. It would prove to be Gresham's only shot at the lead down the stretch. Oregon City's Jake Gettel drove the lane, drew a crowd and sent a pass into the corner where teammate Andre Best swished a 3. "I practice from that spot all the time, I've shot that one thousands of times, I knew right away it was going in," Best said. Abrahamson got fouled going after a defensive rebound, then made the long walk to the other side of the court and sank a pair of free throws to pull the Gophers within 40-38 with less than a minute to play. Best hit a pair of foul shots to keep the Gophers at bay, and Gettel secured the victory when he swiped a steal at midcourt and raced to the rim for an easy two. "We had played solid defense all night, and we needed one more big play to seal the game," Gettel said. Oregon City (18-7) hosts either South Eugene or McNary in tonight's second round, while Gresham ends the season with a 15-10 record and its first playoff appearance in 14 years. "These guys set the postseason as their goal, and they stepped up to get there," Lyslo said. Puclik had an Oregon City assistant coach shouting out 'shooter' and pointing out his location on the floor throughout the first half. Rather than trying to disappear into the corners to get off his shot, Puclik responded with a drive to the basket, ball extended in one hand out front as he sailed past a blur of white jerseys. 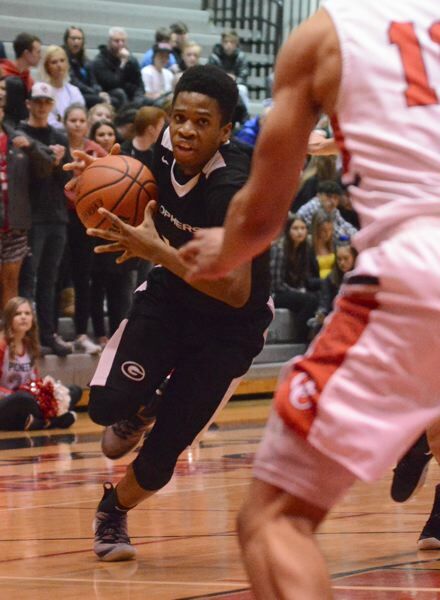 Igbonagwam clapped his hands to show his intensity on the defensive end and promptly earned a closely-guarded call for an Oregon City turnover. Puclik took to the dribble again, this time splitting a pair of defenders on the left side of the floor to reach the rim for a 13-12 Gophers' lead. "They aren't a team that is going to outscore you, but they will out defend you," Lyslo said. "They took away the 3 and forced us to go inside." Oregon City leads the big-school level by allowing less that 44 points per game. 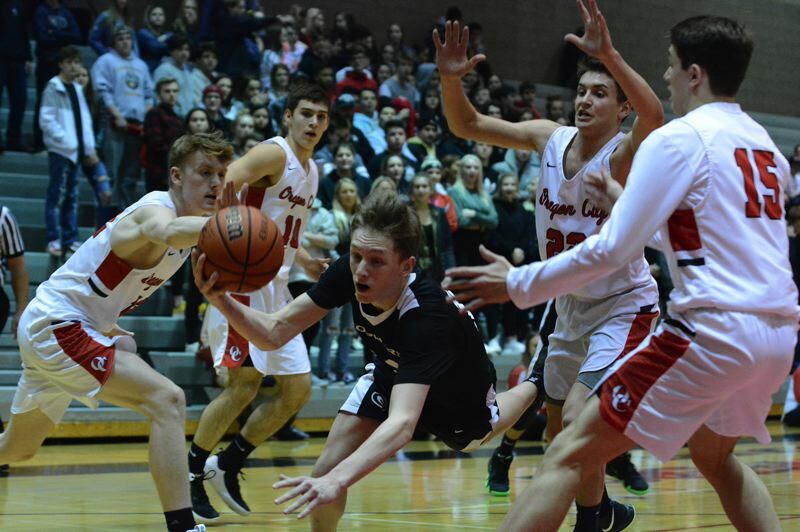 The teams would trade the upper hand five times in the first half before Oregon City pulled away with a series of unguarded shots heading into the locker room. The Pioneers made four trips to the free-throw line in a matter of seconds, going 5-for-8 (.625) to turn a tight four-point game into a 24-15 lead heading to the locker room. The Gophers were saddled with foul trouble most of the night, at one point late in the game they had three starters on the floor with four fouls. Gresham tightened its defense trying to force turnovers late, and two of those starters fouled out within seconds of one another. "We got in some trouble with some key guys in the first half and that forced us to make some adjustments," Lyslo said. This story is slated for our Friday, March 1, print edition. Gresham (39) — Eric Puclik 12, Portin-Chapman 10, Sagiao 5, Abrahamson 4, Igbonagwam 4, Larsen 2, Butler 2, Clinton. Oregon City (44) — Erich Nova 12, Best 10, Remsburg 9, Gettel 8, Welch 3, Talley 2, Bergren.